Chief Minister Prem Kumar Dhumal in the VIIth meeting of the Himachal Pradesh Forensic Science Development Board, said that State Forensic Science Laboratories in the State would be carrying time bound reporting over crime related different investigations within the fixed time limit so that the cases are decided accordingly. Chief Minister said that a time frame, maximum of 60 days had been fixed for cases related to Biology & Serology and Chemistry and Toxicology; 45 days for cases related to Physics and Ballistics related investigations; 30 days for Document, Photography and NDPS cases. He said that all cases received for DNA investigations would be reported back to the concerned agencies positively before 90 days from the receipt of the case in the Laboratory. He said that Tatkal service were also available in the cases where reports were required immediately and investigation or trial was held up for want of reports and the Laboratory would be examining such cases within a week and submit the report to concerned authorities. He said that besides State Forensic Science Laboratory, Junga, regional Laboratories at Mandi and Dharamshala would also be following the same schedule. He said that importance of forensic science had increased tremendously keeping in view the increase in incidents of crimes of different types. He laid stress upon the need to update the examination procedure to keep pace with the technological advancements. Prof. Dhumal said that the Laboratory would also be started to test road and building material, unconventional programmes i.e. LSD etc., retrieval of computer and phone data and testing of samples of petroleum products. He said that with the inclusion of new examinations the State would be matching the standard of national level forensic laboratories. He said that out of 5,733 cases received by the laboratories in the States, 5,118 had been examined and disposed off during preceding financial year of 2011-12 while out of remaining and fresh 1,617 cases 1,136 had been disposed off up to May 31, 2012. He said that with a view to produce more forensic experts in the State, the State Government would be exploring possibilities of introducing one year diploma course in Forensic Sciences under Bio-Sciences Department of Himachal Pradesh University. He said that the State Forensic Science Laboratory had also entered into an MOU with the Directorate of Forensic Sciences, Ministry of Home affairs, Government of India for accreditation of State FSL all over the country and accordingly quality manual had been prepared. Chief Minister congratulated the scientists of the laboratories for carrying fault free examination of different cases which had been of immense help in carrying forward with further investigations in criminal cases. He said that every district was being provided with post mortem kits through the Director of Health Services and necessary training was also being imparted to physicians. P.C.Dhiman, Principal Secretary Home, welcomed the Chief Minister, and detailed various activities, achievements and targets of the Forensic Laboratories in the State. 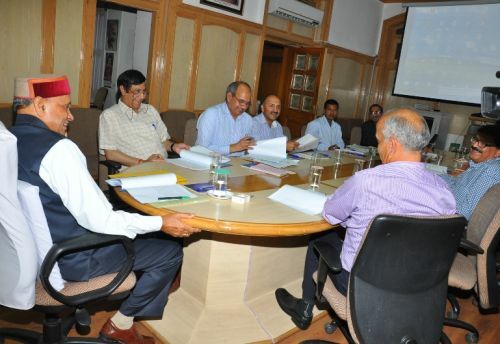 Dr. J.R.Gaur, Director, State Forensic Science Laboratory, conducted proceedings of the meeting and apprised the Board of the latest examination facilities available in the State. Dr. D.S.Manhas, Director General of Police, Jagdish Sharma, Secretary to the Chief Minister, Dr. Shukla, Director Central Forensic Laboratory, Chandigarh, and other senior officers were also present in the meeting.